From our stone animal statue decor collection we present this gorgeous pig statue that will promise to bring a bit of whimsy and playfulness into your home or garden. This durable statue is made from resin and crushed stone. The remarkable detailing on the features on this sitting pig statue are incredible. 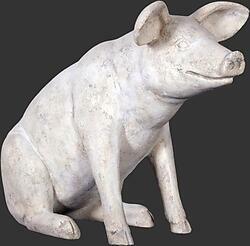 This stone pig statue is sure to add unique style to any special event, garden, or commercial decor setting.